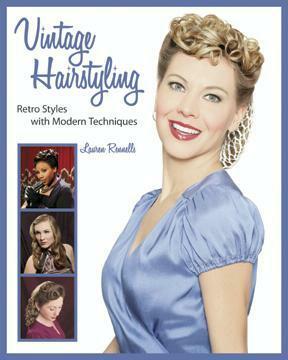 In her book, Vintage Hairstyling: Retro Looks with Modern Techniques, author Lauren Rennells shares industry tips and secrets for creating the starlet and glamorous looks of 1930s, 1940s and 1950s hairstyles. With her experience in the film and photography industry and her unparalleled passion for makeup and hair artistry, Lauren Rennells seemed just to be just the gal we were searching for while on a quest for vintage hairstyling techniques. In this exclusive interview, Lauren Rennells takes us through classic looks, easy styles, and hair color tricks to emulate modern vintage beauty. Which fashion trends influence vintage hairstyles? Every fashion trend, especially the beautiful ones, come around again. The styles popular from the 30's thru the 50's are among the most often recycled. The women looked their most feminine and strongest at the same time. It is the trend that never really goes away. There are times when it is more popular in the media, but there are always girls emulating the fashion ideal of old Hollywood. Vintage is such an overused word nowadays. What period does vintage actually represent? Vintage is a broad term used when referring to items that are from a more recent past. Styles, clothes, furniture, cars… Any of these things can be vintage as apposed to antique. Once items reach beyond a certain age, antique is more often used. 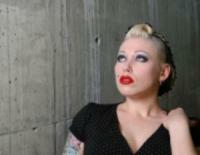 Can you think of different people or periods that stand out for vintage hairstyling looks? There are certainly some celebrities who sparked major hairstyle trends. Veronica Lake's long tresses and peek-a-boo bang, Rita Hayworth's thick, curly, red hair, and Jean Harlow's bleached white style all had influences on girls of their time. What is an easy vintage hairstyle to duplicate? Marilyn Monroe's short curly hair is very easy to copy with a curling iron on a blond. And on a brunette it looks more like a young Eva Gardner. What basic styling tools are needed to create vintage hairstyling looks? Anything that creates a curl. The curl is the basis for most every style in the early 20th century. Which modern celebrities embrace or inspire a vintage look? Burlesque dancer and model Dita Von Teese consistently looks amazing in all her garb. Madonna, Christina Aguilera, and Gwen Stefani have also been great in inspiring woman to try the looks on themselves. Which vintage formal hairstyles are easy to duplicate yet maintain a classic appeal? A really nice formal style is getting the curl in the hair and then wearing it in an up-do that sits low at the back of the neck. It goes well if you are trying for the 30's, 40's, or 50's. Any tips for fashion while incorporating vintage hair? A vintage hairstyle can make any outfit look the era. No matter how new the outfit, if the hair is styled, you've got it. I honestly believe that the hair is the most important part of capturing the glamour of a time period. Which vintage hairstyles can you do at home, and which ones require in salon visits? With enough practice, almost any style can be done at home. But if you don't have time for the learning curve and trial and error, the pin curled styles that require a lot of brushing out may be a little easier for your stylist to handle. Is vintage hairstyling better suited for certain hair types? Certain styles will be better than others for any girl. But all styles can be modified for the desired effect. Hayworth had thick Latina hair while Veronica Lake had very fine hair. In the book, I do a Rita type style on a girl with much more fine hair than what Hayworth had. No girl should feel that she needs to have a certain hair type to emulate a look. Which hair colors work best with vintage hairstyles? One thing I love about these styles is that the hair color can dramatically change the way a style looks. The same style on a redhead looks dramatically different on a brunette. Any quick and easy vintage hairstyle ideas? Hot rollers and a brush. Give yourself a severe part on the side and brush hot rollered hair down towards the shoulders. Instant glam! Thank you for sharing your vintage hairstyling tips! Thank you for giving me the opportunity to share!